This picture is one I have recently finished. It is of Gracie, a short haired pointer. I think she is lovely although I have never met her. I work from photos. People who know me will be aware that I don't "do" new year celebrations. I have done in the past but I have found that the times when I had welcomed in the new year I was caught out when the year turned out to be something that wasn't welcome at all. The two most recent times I celebrated the new year .......with all the "Happy New Year" malarky ...etc etc.....I found that those years held heartbreak and tragedy. When I look further back, I find I have had a few of those so forgive me if I don't get excited at this time. I am now too superstitious to cheer a new year that holds so many unknowns. Whatever it will be, will be I suppose but this is how I feel about it. That having been said......I do wish you all a healthy new year and hope that 2010 is everything you want it to be. Well, Father Christmas came to our house. So, I must have been good after all. This is the time when I miss the family. I phoned Donna and Glenn, and also spoke to Lauren. They were all having a brill time. Philip phoned the long lost brother and family. They were spending Christmas with their stepfather. We had a chat with them all. They had been to the pub so were full of the Christmas spirit. Alan phoned after dinner. He said he hadn't been down to the pub, but he sounded rather merry. This lead me to believe he was fibbing. He is also very happy that Alanmas begins on January 6th. I think he knows how many minutes there are to go. Someone was caught in the act of biting the bows off the gifts. I got lots of lovely things. A couple of watches, jewellery, smellies, hat, gloves and scarf, ermmm.......sweeties, slippers, dressing gown.......oh way too much. I got Philip lots of things too. Blue tooth dvd thingies. Star Trek movie, Wolverine........errmmmmmm Bourne Trilogy. I also got him a new sound system for his computer. And, that in which he is engrossed right now.........Batman Arkham Asylum....a game for the X. Box. I also got him smellies, sweeties, slippers,........etc etc. So we both did very well. Lily was very pleased about that. She loves Gary and spent the whole afternoon snuggled up with him. She is quite picky about who she snuggles with too. He had dinner with us and stayed until around 11.30 pm. I was a bit worried about him getting home as it was still snowing. Actually, we are now Boxing Day afternoon (only they don't have Boxing Day here) and it is STILL snowing. We all ate way too much chocolate. I had lots of liqueurs, which is a tradition for me at Christmas. I have to buy them at Heathrow airport on the way back from my visit as they don't seem to do them here. I had my sherry (cook's perks) whilst cooking dinner, champers with dinner and then cosmos after dinner.......hic...........was lovely. Next year Lauren insists she is spending Christmas with us. I hope she does as we love having her here. Having a child around makes it for me. Today we are not doing much. I cooked enough food yesterday to feed two armies so I don't need to cook today. I got a letter from Norman Stanley on Christmas Eve. How fab was that!!!! He sounded ok although I think his Christmas might have been a bit grim. Hopefully he will put all this behind him and have a much better time next year. I hope all my chums had fun and I will be looking forward to seeing you all in 2010. Yesterday was our annual trip to see Christmas Carol in the theatre. It looked like it could turn a bit iffy as a "snow event" ( I just love it when the newscasters say stuff like this. I think they must spend hours sitting around figuring out different ways to say it is going to snow) was forecast. Philip was at work in Chicago and we hoped the traffic wouldn't be too bad or slow. We had to leave home before 6pm. He got home ok and said it had been a pretty clear run. Off then to the theatre in Downtown Milwaukee, where we saw a magnificent production of Christmas Carol. There was an initial hiccup when the seat I had booked had "special needs". The springs had gone and when I sat in it I sank. This meant that a metal bar at the back then dug into my spine. No way could I sit in this for two and a half hours. Off I went to find an usher and reported my defective seat. He said he would inform his boss. I stood around looking guilty. I don't know why really. I was probably, apart from kids, the smallest person in the theatre. that I should be blessed with this inadequate chair. I stuck my hand up and yelled "ME"
This caused some amusement in the crowd and quite a bit of embarrassment in my partner. He was a lovely guy. a, He would get stuck. b, He would go right through to the floor. I asked if he had a cushion or something I could put on it but instead he moved us to far superior seats at the front of the theatre. This mollified my disconcerted spouse. We had a far better view.........brill. It was the last night and at the end the guy who played Scrooge recited the poem "The Night Before Christmas".........oh he was brill. We then made our way outside ...........and into a blizzard........or should I say "snow event". In some ways it did round off the evening, watching Christmas Carol and then trudging through the snow. The drive home was a bit dodgy as the snow was "eventing" too fast for the snowploughs. I took these two photos from our front door this morning. Philip is at work in Chicago. The drive was fine. He is due home at around 3pm and then we will be staying inside. There is a threat of an ice storm but as long as we are at home and we have nowhere we need to go .......that is fine. I hope all of you have a wonderful Christmas. I think our house looks rather festive. It is nowhere near as good as the ones in Candy Cane Lane though. This is a neighbourhood where they go all out with lights, figures ....even ice sculptures ...in their gardens. It is all in a good cause as they collect money from the hundreds of cars slowly driving around the streets. Father Christmas is always there talking to the kids in the cars.........this terrified Lauren when she was here. Various volunteer groups walk up and down in our sub zero temperatures collecting. When Donna, Andy (her husband who tragically died) and little Lauren came with us, it was Firefighters night. Whilst Donna and I woofed over the firefighters, Andy was extremely miffed. "Trust us to come on bloody firefighters night" said he, "why couldn't we have come on Baywatch night". We still laugh about it now. He brought us a lot of laughs. I think of him often. Inside our house I like to Christmassy it up too. I always did. Those that remember me from back then will know that Shalamar was always well decked our for Christmas. Friday we did Candy Cane Lane. Sunday we did Country Christmas in Waukesha. This is a magnificent drive through a forest which is full of lighted animated figures. Then at the end they have two buildings, one with a Christmas scene with elves and lots of train sets. The other holds the traditional nativity which is very beautiful. We all feel very Christmassy now. A friend talks in his blog about his Carol singing memories. I used to go Carol singing as a kid, sometimes with mates and sometimes in an organised group from school. As he did, we also got a mixed reception. I actually love to hear Carol singers. We don't seem to get them over here. This may be because the weather is so blooming cold and also maybe because people are afraid to let their kids out in the dark these days. When we spent the year in sunny Bradford we got Carol singers then. I did what I always used to do. They tend to ring the doorbell and then launch into a hasty rendition of "We wish you a merry Christmas......."
This, in my opinion, isn't a Carol. So, I would stop them mid warble and tell them I would happily give them some dosh if they would sing me a proper Carol. They found this much harder than I thought they would. I wonder if kids even sing Carols in school now. They would look puzzled........then thoughtful.........and then I would generally help them out by suggesting a few. Eventually we would find one that they had a little knowledge of. They knew few of the words to even basic ones like, Away in a Manger........Hark The Herald Angels..........Silent Night........yet I can remember the words to these and many more just from when we sang them in primary school. 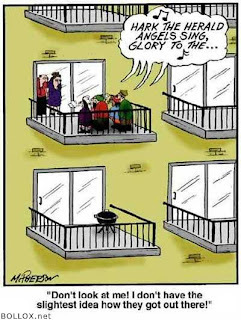 We sang so many and so often. I still miss going to the midnight carols in the church in Kingsnorth on Christmas Eve. It was brilliant. We lived half way up the hill. The pub was at the bottom of the hill and the church at the top. So, it was down to the pub till just before 11pm........meander up the hill to the church for the carols and then back home for a night cap. I always felt guilty that it was really the only time we went in the church but it started our Christmas for us brilliantly. I hope Carol singing isn't becoming a dying tradition. For those out there that complain about them I suggest they try my suggestion to get a real Carol sung just for them. I think it is worth it and wish it happened here. Well, by now you will know that Milwaukee gets a lot of snow. I think the average is around 9 feet or 3 metres of snow during the winter. It doesn't mean traffic, trains, buses or planes come to a halt. It is what happens every year so roads are quickly cleared and life goes on. More than that actually. People make the most of it. I will say this for Wisconsin people .........they do enjoy the seasons and winter is no exception. 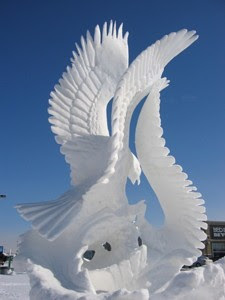 This weekend there is a snow sculpture competition down at the lake front. We have seen these before. 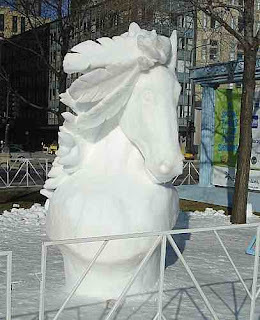 They often have them in the streets of downtown Milwaukee and they are fabulous. These ones are pretty good but, to be honest, we have seen even better ones. So, as I hear that England is in the grip of an arctic blast .........I expect you all to be outside doing your snow sculptures. At least you won't have to deal with the ridiculous temperatures that we have. This morning I went to work wearing the following......steady Dave .........don't go getting excited. Tights, silk long johns, trousers, silk vest, silk long sleeve top, jumper, scarf, headsock, ear warmers, huge coat with hood, snow gloves and snow boots. I was ok for about 5 minutes before the cold started getting through to my legs. It was about minus 15C which is warmer than it has been............ha ha....warmer. Milwaukee is the home of the Harley Davidson motorbike. The very first bikes were made in a shed somewhere around here many years ago. Now we have a Harley Museum and hotel and bar....etc, etc. We took Alan to the museum last year and although I know nothing about bikes, I have to admit it was very well done and very interesting. 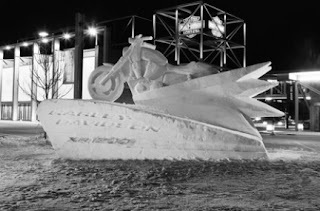 The above picture is of a Harley done in snow outside the museum. Pretty clever stuff I think. Yesterday we had our H1N1 (swine flu) vaccinations. Do you have them over there in dear old Blighty? I haven't heard much about it on the BBC online. Here it is still a really big deal. We had to queue for about 3o mins but at least it is done now. Philip is out Christmas shopping this evening. I have done most of the rest of it now.......unless I think of something else which is often the case. 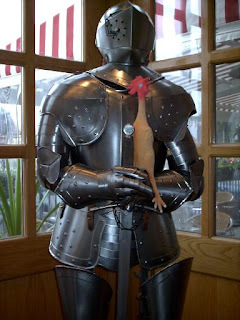 Frank the Chicken with friend. Well, the mystery is solved. Dave solved it. Well done that man. It seems no one could leave any comments on my blog because the stupid thing wasn't working. Now, I am not saying that this means there are millions of would be commenters out there just itching to comment on my goodly blog, but it does explain why there were none at all. I spent a rather frustrating 30 mins re doing all the settings........nope still couldn't comment. Hmmm.............I then bimbled around for a bit more until I found that the tra la posh Christmassy template that I had on there was the culprit. It would not allow comments. So, I have had to go back to this boring old one. At least if anyone should want to say something.........now they can. Ta again Dave for letting me know. 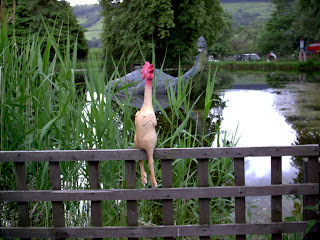 This is a photo of my rubber chicken, Frank, with the Loch Ness Monster in Scotland. It has nothing to do with anything. I took this picture on one of our trips to Scotland when we spent the year is sunny Bradford. Frank went everywhere with us. I am a bit surprised at the lack of comments re Klingon Panto. I thought there would have been many fond memories of those days and that some people would have thoughts to share. It would seem I am wrong. Maybe I remember them as more fun than they were. I know our memories play tricks with us so maybe it was pants. Well, it wasn't pants as far as I was concerned. Heh, heh......silly me.........maybe no one reads this twaddle anyway so no one could add a comment. Today was still very, very cold. I know I don't weigh an awful lot but I am still amazed when I can walk on top of the snow. I have sent all my Christmas cards now. I have nearly finished the picture of the dog I am working on. The weather keeping me inside helped. Next week I will be putting the marzipan and icing on the cakes and making the yule logs. I received some beautiful cards from my son, daughter and granddaughter. Philip also got one from Lauren addressed to the Rock Band Master. She tells me she is spending Christmas here again next year. I am very glad. I have found out that in Minnesota they have a production of Christmas Carol done by Klingons. Take a peek here if you don't believe me. Pah.......say I ........we did it first. We were doing Klingon Pantos before they had ever dreamed of doing Christmas Carol. Oh what fun they were too. Mind you........I have never made up so many Klingons at one time. So many wigs.....so much make up.........so much liquid latex. Such inventive names..........I remember one who they tried to video with me, can't remember the story line, just know that I completely lost it every time he spoke. He never kept to the script, would throw in outrageously rude lines and my being a helplessly giggling Klingon just didn't seem fit the part somehow. Those that were part of the set up then will remember Rabid Sod. I do believe that everyone who took part had a lot of fun. Those that didn't want to be made into Klingons had equally important roles as ambassadors and were part of a jury....if I remember correctly........in one of our epics. Poor Dave probably felt the way he does right now after having his tooth out. 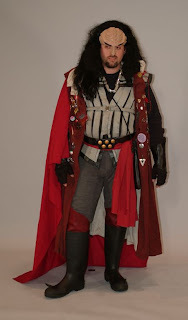 He was playing the part of a Klingon who had been stabbed and had fake blood all over his shirt. There was much arguing and blustering going on.......as is the way with Klingons.....and no one seemed to be paying attention to poor K'utee.....I think that is how you spell his Klingon name....with his stab wound. "Well no one seems to be taking any notice of me and I am really rather poorly." Oh my goodness........a fierce Klingon who was feeling really rather poorly. I understand that is how he is feeling today and hope that he is better soon. This is a photo of the red tail hawk taken in our tree yesterday. This is right above our birdie feeder. Needless to say that the birdies had all buggered off. I watched him for a while until he slowly flapped away. I know he is just as hungry as the other birdies but hope he gets his dinner elsewhere. Yesterday evening the snow was really starting to mean it so I thought I had better put some food out for the raccoon and the rabbits. I was so pleased when I looked out of the kitchen window and saw a possum scrabbling through the snow, searching for some goodies. I love possums. We had one that used to visit us every night a few years ago but that was when we lived in another part of Milwaukee. I called that one Blossom the Possum. I will put more stuff out tonight and watch for it. It must be so hard for these animals with all the snow on the ground. Getting very cold tomorrow too........so I am told.....could be minus 20C. I think he has the opposite of the condition that anorexics have. The one where , if they look in the mirror they see themselves as fatter than they are. Bubba thinks he is slimmer than he is. He was determined to fit into this cat bed (bought for Lily who is of a much lighter constitution). Give him his due ....he did get into it............eventually. Although by the look on his face, he didn't get a lot of pleasure out of it. A friend's blog talks of global warming and the summit......etc. Well, there isn't much evidence of it here. We are currently under a severe winter storm warning with 14 inches of snow predicted tomorrow night and into Wednesday. That should make walking to and from the bus stop interesting. On Saturday we went for brekkie at our usual Saturday brekkie place.......Panera Bread. I had my usual bagel and cream cheese , which was delish..............but...........sitting just across from us was ........Father Christmas. Not your run of the mill, everyday, mall, pretend Father Christmas .........but the real one. He was sitting with his chums, not elves though, eating his brekkie !!!!!!!!!!!! He was a big man, white beard and hair, dimples in his cheeks........he even wore a Santa hat. I have never seen anyone look more like Father Christmas. A lady who was sitting at the next table asked him if she and her daughter could have their photo taken with him. He was more than happy to oblige and one of his friends, not an elf, took the photo for her. Shortly after this he got up, as I thought to get more coffee or go to the loo. Whilst he was gone, to Philip's utter dismay, I announced that I wanted him to take my photo with Father Christmas when he came back. But then to Philip's delight..........he didn't. He must have left the shop and I hadn't seen. That was the nearest I have ever come to having my photo taken with the real Father Christmas and I missed it. I hope I don't get a bit of coal for Christmas now. 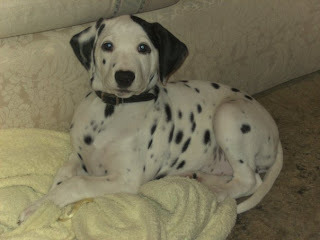 This is my niece's dalmatian puppy.........Sophie. I thought so until my nephew pointed out that in this picture she looks like Hitler. She even has the little moustache. I think that is so brill. Anyways, I think I have to get another job. This is the second week in a row that I have been told not to go in. I suppose it is a sign of the times but right on top of Christmas I cannot afford to be without any money. My biggest problem with getting another job is transport. At the moment I can get the bus to work but mostly you need a car. Everything is so spread out that everyone drives everywhere. I saw a brill job advertised that I would love. It is in a children's science museum. The museum itself is amazing, with lots of interesting hands on exhibits. It is right on the lakefront downtown and had we still been living there I would definitely have gone for it. But, for me to get there using buses............I would need to get a bus to the mall.......walk through the mall and out the other side, then get another bus from there to downtown. This would probably take me around an hour and a half......at least. Another problem I have is needing time off to visit England and for when Lauren visits here. There are a couple of local schools and I am thinking of asking if they need any help. At least if I got a job in a school I would have the summer off and could do my travelling then. I suppose I shall have to wait until after Alanmas.